/ in news, 3D, Printers / by . Two food-creating 3D printers that will launch later this year have been unveiled in Las Vegas. However, experts said their prices would be likely to limit sales. The basic version will cost about $5,000 (£3,000) and the more advanced one double that price. 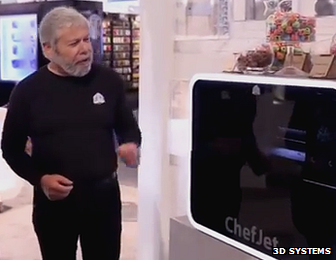 US firm 3D Systems is showing off the machines at the Consumer Electronics Show (CES) in Las Vegas. It also has a new $10,000 model that prints ceramics and another $5,000 one that creates multi-coloured plastic objects. Until now one of the most common uses for 3D printers within these price ranges has been rapid prototyping – the creation of models used to envisage the look of a design rather than to make products that could be put on sale themselves. 3D Systems developed its new “food-safe” models after taking over a Los Angeles-based start-up in September, which had customised one of its machines. Both models can print using chocolate, or sugar infused with vanilla, mint, sour apple, cherry and watermelon flavours. The larger one has the advantage of being able to create “photographic-quality” pictures by mixing together different ingredients that can then then be wrapped around cakes and other surfaces. The designs are built using a layer-by-layer printing process. Sweets are created by spreading a fine layer of the flavoured sugar, and then painting water on top using a jet print head to turn the substance into hardened crystals.